Sometimes when you’re traveling with your kids, you want to feed them with snacks that are inexpensive, healthy-ish, and convenient to throw in your purse. Ya know, something to hold them over until their next meal. Or doesn’t cause a complete crumb explosion on a bus. Even Beyoncé brought snacks for Blue Ivy at the Grammys, so why should you be less cool? The good news is that supermarket food in Spain is not ridiculously overpriced. So right now, please unload that suitcase full of Cheerios. You can find what you need at the local supermarket / grocery store. Of course, the first choice is something natural like fruit, dried fruits, nuts, or yogurt. You won’t have a problem finding those foods at all! 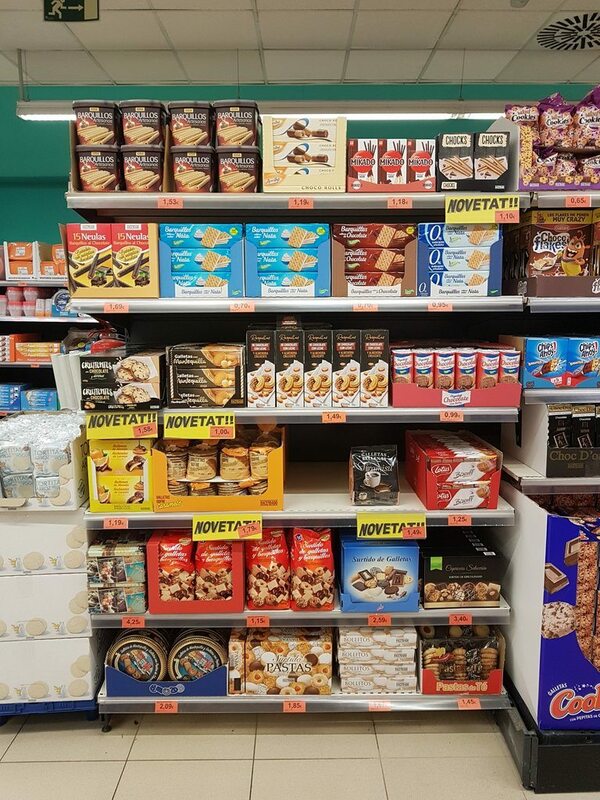 The cookie aisle continues to tempt me. These are sausages “sticks” that fit in a kid’s fist. 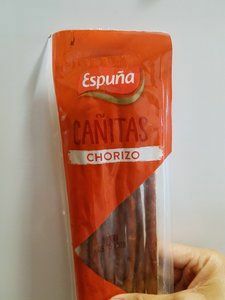 Chorizo is a cured pork sausage with smoked paprika and garlic. Fuet is also a cured sausage, but with no paprika, and it’s drier. My kids love bring them to school for their esmorzar (late breakfast) and accompany it with two slices of baguette bread. Munching on 1 or 2 cañitas will make for a filling snack. They’re in the refrigerated section, but I’m sure they can hold for the whole day. #triedit. Espuña is a brand I’ve seen often, but there are other brands. The benefits of carrying a squeezable yogurt pouch is that you don’t have to have a spoon handy, and you won’t make a mess. They keep for 4 hours. Although I’m guilty of having gone past that – and no one got sick. It’s found in the refrigerated section and sold in a pack of 4. 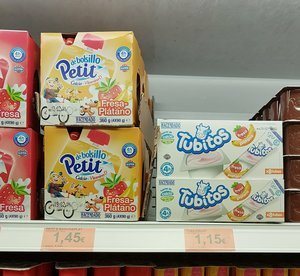 They also have Tubitos, which are new! That is definitely the answer to USA’s Go-gurt. Yogurt to go at only 1.45 euros! Where I’ve seen them: Mercadona. 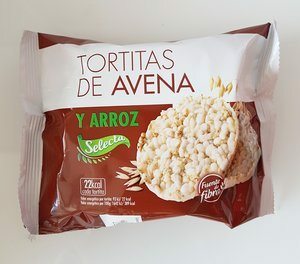 Called tortitas de arroz, these airy snacks are good to hold a kid over for an hour that’s creeping towards lunchtime. They have all kinds of tortitas: oat, corn, and ones topped with milk chocolate or white chocolate. The oat and rice variety. My first kid loved fruit pouches, my second, not so much. But there are also ones geared to older kids at Mercadona. They come in apple and banana, strawberry and banana, and mixed fruit. I believe they added a chocolate one also. 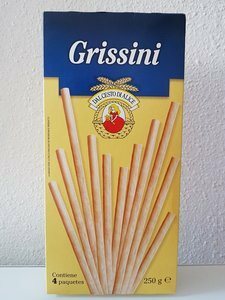 You can find these thin breadsticks, or palitos, bastones, or bastoncillos de pan everywhere. Sometimes bakers will offer a breadstick for free to a child at a bakery! Where I’ve seen them: all supermarkets. Oh man, I grew up on string cheese. The commercials showed up on TV here in Spain, and my daughter just had to try it. I’ve only seen one brand, Cheestrings. But if your kid likes cheese that peels in layers, this is your queso. Another cheese option are these circular single servings of cheese. They come in a small bag in the refrigerated section. 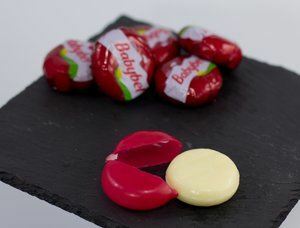 Another cheese option! You get 16 or 24 triangles in a wheel. Found both refrigerated and non-refrigerated section. Want a smoothie in a pouch? Well, in Mercadona, they’ve got 4 flavors, made with 100% fruit and vegetables. I personally tried the Verbena Detox, and I thought it was gross. :-/ However, they also have Menorca (pineapple, coconut, mango), which look good! They’re fresh in the refrigerated section. Mercadona is truly a leader in the supermarket business. It’s my favorite, and, from what I hear from other expats, their favorite as well. In the past year, I’ve see chia seeds, coconut oil, soy sauce, things that they didn’t have two years ago! They have a large selection usually have a fishmonger, butcher, and fresh fruit. Very complete. Bon Preu – This local Catalan chain sells qualty meats, fruits, vegetables and more. Inside decor is usually clean and tidy. LIDL is a German supermarket chain that seems to be everywhere now (I hear, in the US as well), and it’s recommended for basic stuff. They’re also known to come out with Monday and Thursday sales and limited products. They don’t have fresh fish, but they have a wide selection of fruits and vegetables. Condis is also a local Catalan chain, which usually has their own butcher and fishmonger. They started merely as a small stand in the local market (Mercat de la Mercè) in Barcelona! Veritas is kind of like a Whole Foods in the US. Only smaller and not as pricey! Ametller Origen – This supermarket is beautiful. It has that down-home kind of feel (warm, bright lighting) and has goods that are fresh, ecological, and local. El Corte Ingles Supermercado – El Corte Ingles may have in its wide selection of foods, and it’s considered good quailty. 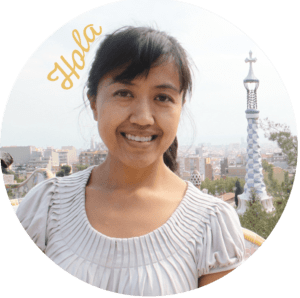 They have a crowded supermarket on the bottom floor of El Corte Ingles in the Plaça Cataluyna. Día – Día is the supermarket for discount prices. It’s a hit or miss shopping experience. Some chains need updating in the interior and look quite disorganized. Others look well up-kept. But it has everything you need. 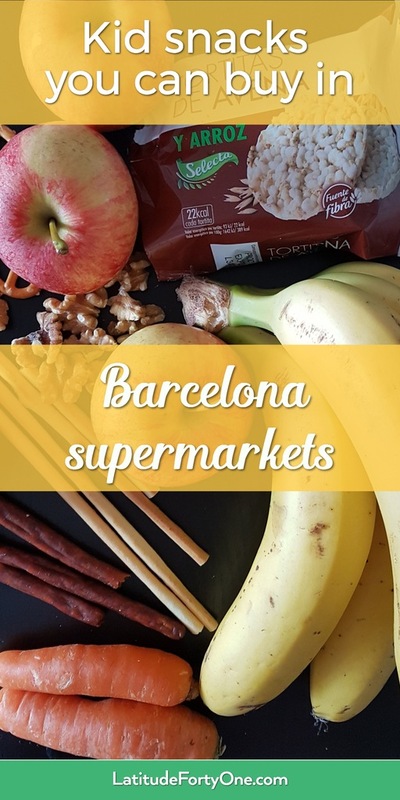 Other supermarkets are Consum, Caprabo, Bon Àrea, Eroski, Coviran, Aldi (only 2 in Barcelona), Suma, and more. Check out them out at this website, which has all the weekly deals on supermarkets. Hypermarkets are large supermarkets that sell food but also inconsumible goods. Basically, it’s a department store. Those are Alcampo (which got voted the cheapest for food), Carrefour, and El Corte Ingles. El Corte Ingles has probably the best quality, but they’re also more pricey. Convenience markets are Spar, Supercor (from the El Corte Ingles brand), where you can buy your basics: bread, milk, soda, batteries and other sundry items. Prices will be higher here. 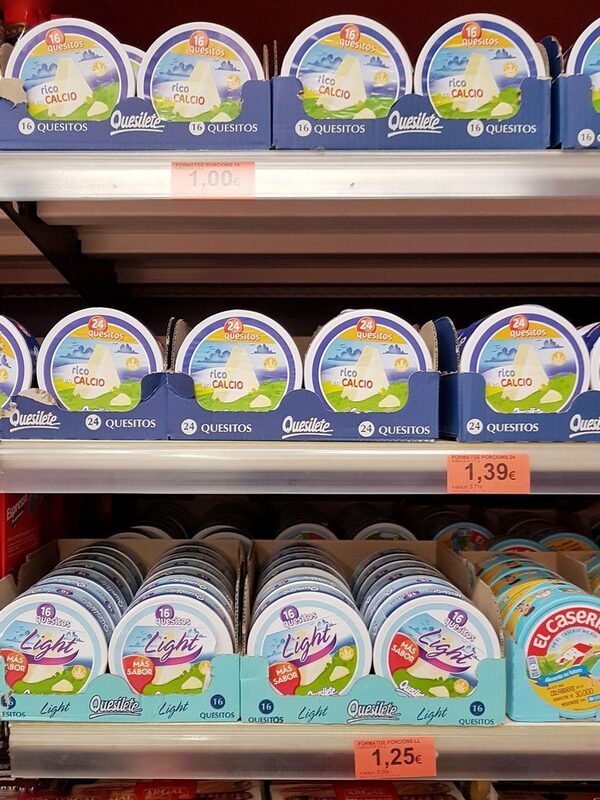 If you want to browse through some deals, you can check out the weekly catalogues from all the supermarkets and other retailers at Tiendeo website. So there it is! Stay tuned, I’ve decided to make this a food series on eating out with kids. Next – what to order for kids when eating out! If you live here, what are some snacks that your kids like? If you don’t live here, do you have any questions about food? Let me know in the comments. Or send me a message on Instagram! I’ve been hanging out there a lot lately.